ULF Paprika 299263 1/4 tsp. ULF Black Pepper 299388 1/8 tsp. ULF Garlic Powder 298745 1/8 tsp. Combine Sweet Baby Ray’s buffalo sauce, butter, paprika, black pepper and garlic powder in a sauce pan over medium heat until melted, stirring occasionally. Cover sauce and keep warm over low heat. Deep fry shrimp until cooked thoroughly. The shrimp should have a nice golden color. 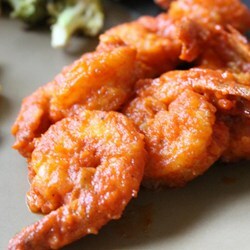 Toss shrimp with buffalo sauce mixture and serve with bleu cheese and celery sticks.